The Genius SP-HF1800A speaker system consists of two tall, hefty “three-way” speakers with no subwoofer. This makes them a 2.0 system, which may appeal to those who don’t want a bulky subwoofer getting in the way -- although, of course, this means that you’re sacrificing some bass. For the price tag (they can be purchased on Amazon for $89), the system is impressive looking and not too shabby sounding. 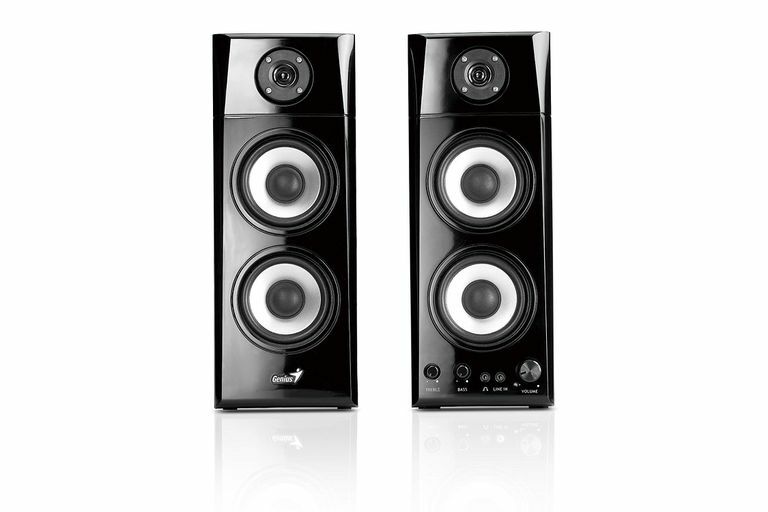 Unlike many of the systems reviewed on this site, the SP-H1800A speakers are tall and heavy, measuring 15 inches by 6.25 inches by 5.75 inches. That's on the larger side for computer speakers, and unfortunately, the power cord was a bit short for a system of this size. These are most definitely not for those who have desktop space concerns, although they're pretty serious-looking speakers for your average desk jockey. The tweeters and woofers are exposed, which is always kind of cool if you like to watch them shake when you turn up the bass. The lack of a grille can also prevent any sound interference, although you'll need to be extra careful since there's no protection from debris and damage. The sound is warm and even for both music and movies. Highs were crisp, and lows only became a bit muddy when the bass was at full capacity. Overall, this doesn't seem to be a system that overreaches in its expectation, and as a result, you're getting a solidly satisfying system. The speakers would be powerful in a small office or bedroom for personal use, but they wouldn't exactly knock your socks off if you're hosting a screening party for friends. They are fairly priced, but you should also check out Logitech's Z323 system, which has smaller drivers but adds a subwoofer.